B&G Foods, a pure maple syrup powerhouse, is the largest bottler of pure maple syrup in the United States. 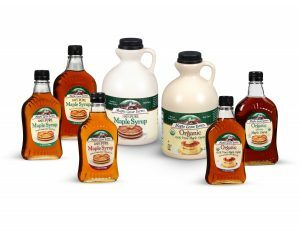 Tapping Season is now underway, so it’s time to celebrate and learn more about B&G Foods’ extensive offering of pure maple syrup brands, including: Maple Grove Farms®, Spring Tree®,Cary’s® and MacDonald’s™. Cary’s, is the oldest maple syrup brand in the United States, founded in 1906 in St. Johnsbury, Vermont. Cary’s pure maple syrup is available in Amber Rich nationally in 8 and 12.5 fluid oz. sizes. MacDonald’s pure maple syrup is available predominantly in the Midwest and West Coast in two sizes of Amber Rich: 8.5 fluid oz. and 12.5 fluid oz. Stay tuned! I will be reviewing soon! Based in Parsippany, New Jersey, B&G Foods, Inc. (NYSE: BGS) and our subsidiaries manufacture, sell and distribute high-quality, branded shelf-stable and frozen foods across the United States, Canada and Puerto Rico. With our diverse portfolio of more than 50 brands you know and love, including Back to Nature, B&G, B&M, Cream of Wheat, Green Giant, Las Palmas, Le Sueur, Mama Mary’s, Maple Grove Farms, Mrs. Dash, New York Style, Ortega, Pirate’s Booty, Polaner, SnackWell’s, Spice Islandsand Victoria, there’s a little something for everyone. For more information about B&G Foods and our brands, please visit www.bgfoods.com. Self Disclosure: Information and images were provided. I will be receiving samples and reviewing soon so stay tuned!